If you are planning a cross-country trip, or even a smaller scale of one, consider catching up on some safety tips for towing and RV or camper through Indiana before your journey begins. 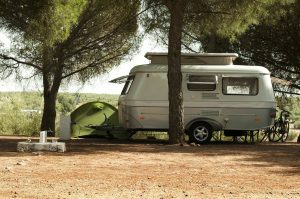 Recreational vehicles are a prized possession to certainly be proud of; but maintaining the safety of the camper, other drivers, and everyone on board is priority. Keep reading to peruse some tips on how to tow a camper safely through Indiana this spring and summer. The first thing you want to do when planning to tow a camper or recreational vehicle with your car or truck, is locate the towers manual it came with at the time of purchase. Every camper or RV should have a manual that retains information about towing rate, weight ratios, and procedures. If you cannot locate this, contact the manufacturer for a copy. Knowing the towing rate is imperative to hauling a camper or RV with your vehicle. If the load in the camper is heavier than your vehicle, it will not be able to sustain the haul. The manual also explains the proper hitch and tow procedures for your make and model camper. Following the manufacturer’s instructions is vital to towing your RV safely. Another important area to check is your luggage and load items. Be sure everything is secure and in place within the camper and securely attached to your vehicle. This is to avoid items falling out of your camper and endangering other drivers. You also do not want to lose your luggage. It is also necessary to make sure all the items within your RV or camper is evenly distributed so it is all balanced. This puts less stress on the vehicle pulling the haul. Be sure to have the correct hitch for your tow. It is a good idea to use a stabilizer bar as well, for a more secure and straight driving. It reduces the risk of swaying on the road. It is advised to seek out professional advice if you cannot locate the owners’ manual for your camper or RV. They can properly identify the make and model of your camper and find the information you need for a safe towing experience. 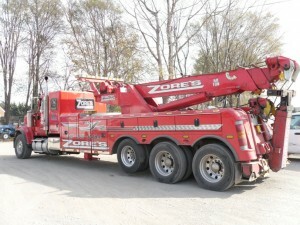 Call Zore’s Towing in Indianapolis, IN for the most accurate and reliable RV towing and camper towing advice around. We are long-term veterans in the wrecker industry; serving Hoosiers for over 80 years! We have been Indy’s towing experts since 1927 and continue to grow in our business. We are happy to answer any questions you have about choosing a proper tow hitch, RV towing, and more! Visit our website at http://zorestowing.com, or call us directly at 317-247-8484 today. This entry was posted in RV Towing and tagged camper towing, indianapolis, RV towing, tow an RV, towing a camper. Bookmark the permalink.